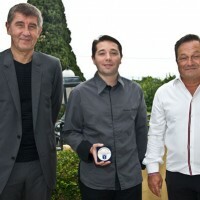 In honor of Paloma’s Michelin star in February, Mougins presented the Medal of the City to chef Nicolas Decherchi and the brigade of the gastronomic restaurant. 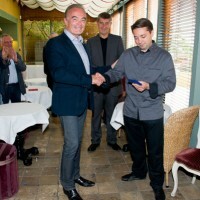 Richard Galy, mayor of Mougins, Joël Folant, delegated to tourism and members of Mougins Tourist Office, honored the restaurant Le Paloma and its Chef Nicolas Decherchi, whose talent was recently crowned with a Michelin star. By obtaining the famous macaroon given by this guide, always eagerly awaited by the world of gastronomy, the Paloma restaurant, eight months after its opening, entered into the exclusive club of Michelin stars and now belongs to the 57 new one star tables of the 2014 edition. 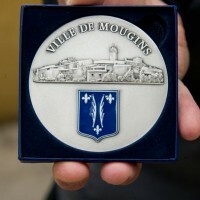 The whole team and the designer of the restaurant, Gilbert Franchitti, also received this medal, awarded to persons who have contributed to the fame and reputation of the city. At the head of this magnificent establishment, a talented young chef, Nicolas Decherchi, 32 years old, boasting a star-studded journey as he made his first steps in the world of gastronomy at the famous Bruno in Lorgues. 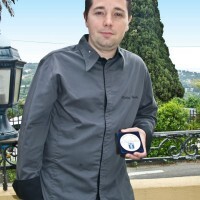 Having served in the Louis XV in Monaco in 2003 and 2004 and La Chèvre d’Or in Eze between 2005 and 2007, he enriches his skills alongside Eric Fréchon at Hotel Le Bristol from 2007 to 2009, during which the restaurant has been awarded three Michelin stars, and finally with famous chef Cyril Lignac. Nicolas Decherchi now claims the a “homemade” cuisine, and seduces the gastronomes with his southern menu oscillating between tradition and creation that he established at the Paloma restaurant. With the help of his two pastry chefs, Yohan Jara and Benjamin Scordo, and his brigade who lends a hand without fail, Nicolas Decherchi has raised Le Paloma to the rank of starred establishment. The restaurant, an ancient stone villa in an enchanting setting that is bearing the name of Pablo Picasso’s daughter, located at the entrance of the old village of Mougins, was entirely decorated by Gilbert Franchitti. Welcomed by parking valet at the foot of the hotel, you will be seduced by the elegance of its room illuminated by a luminous bar, completed with a “cigars’ room”, the contemporary stone sculptures by Pierre Chazelat, the decor, the smoked-glass custom-built wine cellar, the terrace adjoining a comfortable lounge and its tables set up opposite the hills of the city, offering a undulating green countryside spectacle to the sea. 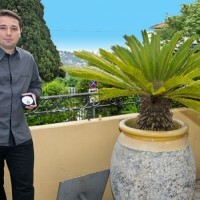 Many asset that make of starred Restaurant Paloma in Mougins a not-to-be-missed place of gastronomy and luxury. Le Paloma – 47, avenue du Moulin de la Croix – 06250 Mougins.